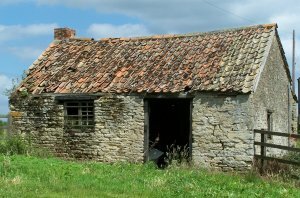 Most rural villages had a smithy or forge. Traditionally "Smiths" were metalworkers and a blacksmith worked "black metals" (iron & steel). An important member of the pre-industrial times, the village blacksmith would produce and repair all the metal implements used for farming (and/or weapons in wartime). Caldecott's smithy was located near the junction of the Caldecott Road and Bidwell Lane, and the building still remains. Chelveston's was up High Lane near what is now Disbrowe Court. 1851 Thomas, William (son) & Thomas (son) Jellis. 1861 William Jellis, George Henson (apprentice). 1871 William & Walter (son) Jellis. 1881 Walter Jellis, Fred Ekins & Joseph Judd. 1891 William, Albert (son) and Arthur (son) Ekins. Farriers were specialists in horse's hoof care. Since in pre-industrial times horses provided the means to pull farm machinery (such as ploughs and carts) and were the principal means of transport (carriages and horseback). this was another highly valued skill in the community. Farriers combined a knowledge of the blacksmith's trade with equine veterinary (e.g. anatomy of the hoof).